Friedman’s challenge consists of two fundamental problems with principled libertarianism that, even after 40 years, no one has answered to his satisfaction. His first is the old question of why someone should be libertarian, stating plainly that, “Libertarians have not yet produced any proof that our moral position is correct.” Friedman personally finds certain utilitarian arguments to be convincing, but obviously not sufficient for all people. He recognizes that moral arguments are similarly convincing to some but not others. While no one has developed a perfect strategy for persuading potential libertarians, there are certainly some approaches that are noteworthy. Michael Huemer argues that because there are some generally accepted libertarian principles that most people agree on, it is therefore possible to conclude that libertarianism is the logical ethical system to use. Hans Hoppe argues that merely attempting to make an argument implicitly acknowledges libertarian principles, so any attempt to logically attack libertarianism is bound to fail. Similarly, Stephan Kinsella argues that only those who behave in a libertarian manner have a basis for legal claims, so the principle of estoppel implies libertarian conclusions as well. There are also many people who contribute to the utilitarian arguments in favor of libertarianism and, more specifically, anarcho-capitalism. Of course, none of these has bridged the is-ought gap so, for now, there may be no answer to Friedman’s first challenge. He attacks various versions of libertarianism using continuum problems. The first is the well-traveled question of how much light neighbors can emit onto their neighbor’s property. Another is how much risk is acceptable for libertarians to take when they make decisions. A third is how good does some consequence need to be in order to justify violating the NAP? Continuum problems like the first one are not very interesting because they are not well posed. The answer depends on a number of factors, such as the individuals involved, the social norms involved, current technology levels, etc. If someone asks “How many apples does it take?” the obvious response is, “to do what?”. If someone asks “How many photons can I send towards my neighbor without violating the NAP?” the same idea applies: it depends on details that have not been given. It should not be alarming that libertarian theory does not specify how many photons are acceptable to direct towards a neighbor’s house. Libertarianism is based on a general principle that can be applied to many situations, and does not pretend to be an exhaustive list of predefined behaviors that are deemed acceptable. The second two are really the same question. They are a way of expressing discomfort with the idea that the future is unpredictable, and that libertarianism cannot provide any guarantees about whether any particular action will be ethical. The best that can be done is to elaborate libertarianism in a way that allows individuals to use their understanding to make the best choices about how to behave. Just as Friedman wonders how certain one must be before deciding guilt in a criminal trial, one must decide how certain they must be before taking any course of action. The most straightforward example is Friedman’s abandoned cabin problem. He wonders what a person should do if they are starving in the woods and chance upon an unoccupied cabin stocked with food. Clearly someone else owns the cabin and the starving traveler does not know whether the owner would give him permission to eat some of the food. But libertarianism does not demand that someone get permission before using someone else’s property. Doing so merely lowers the risk of violating the NAP. An individual can never have perfect certainty that something they are about to do will not violate the NAP, but by following certain social norms, most people can get through their day to day affairs without engaging in any unethical behavior. In more extreme scenarios, the uncertainty surrounding action grows. Still, the analysis and resolution are always the same. An individual must evaluate the risk, decide whether he is willing to accept that risk, and then proceed or not proceed with that particular behavior. In every situation, a libertarian will have something they want and will have some risk of violating the NAP. Depending on how important the goal is to them, the risk they are willing to take in achieving that goal will change. Normally a libertarian would not shoot in the direction of an unarmed woman who is standing across the street. However, if she is being held hostage and he thinks he can shoot her captor, he might decide to do it. Similarly, he might borrow a gun to save a crowd of people, even if the risk of violating the NAP is much higher than normal. Various factors will affect the risk in these situations, including social norms. Being libertarian does not mean that one never violates the NAP. It merely means that the NAP is the ethical principle one uses to decide how to behave. Even the most devout libertarian might accidentally step on someone’s toes. That this is not clear from certain formulations of libertarianism is a failing of their definitions rather than on libertarianism itself. Historically, libertarian theory is founded on the idea of property. For everyday problems, this turns out to be good enough, but it is far from a sound theoretical basis, as Friedman shows. Property is just a convenient system for implementing libertarian principles, but it is not itself a principle. So, libertarianism needs to be reformulated on a more fundamental level in order to meet Friedman’s challenge. He rightly points out that certain formulations of libertarianism can be used to derive non-libertarian conclusions. For example, he shows how simple versions of the NAP have trouble dealing with the inherent risk involved in all human action. He shows how simple property systems cannot easily generalize to pollution problems. Having no answer, he guesses that the way libertarian principles have been defined is not quite right. He leaves finding the correct definition as an exercise to the reader. A strong exposition and defense of anarcho-capitalism. Current and challenging topics. Five Murrays. The problem is that libertarian theory does not say how one could, even with all relevant information, answer that question. Any formulation of libertarianism is going to present some rules and then require one to figure out how to apply them to a given situation. Even poor formulations like “do not initiate violence that causes harm” give some guidance as to what to do in that situation: don’t send so many photons that the door is damaged. Do you believe that it is impossible to formulate libertarianism in such a way that, given all relevant information, one can always decide whether any particular action is ethical? 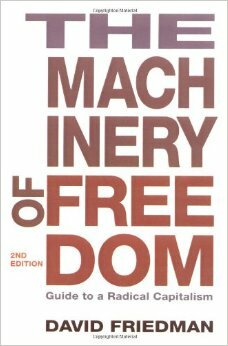 I solved David Friedman’s “Hard Problem” before I wrote my AP (Assassination Politics) essay in 1995. https://cryptome.org/ap.htm I was not, at that time, aware of the book Machinery of Freedom, nor of Friedman himself, but nevertheless I was aware of the general problem of it being difficult or impossible for a libertarian or anarchistic society to fund its own defense. I remained a minarchist libertarian, as a consequence, until January 1995. That month, while trying to solve a different problem, I figured out how to make anarchism actually stable, and thus possible. What I invented, with AP, was a method whereby participants could voluntarily and anonymously fund an operation to target threatening people, including the leadership of a foreign power. I’ve long waited for David Friedman to acknowledge that I solved his “Hard Problem”. He certainly deserves the credit for defining the problem; I’d like the credit for finding the solution.